Who doesn’t love puppy kisses? Those sweet smelling demonstrations of sheer love are easily one of the best parts of being a dog owner – until those puckers come with sour morning breath that lasts all day and into the night. Just as probiotics can change the environment of your dog’s stomach, when combined with our plant sourced ingredients, they can also alter the ambiance of his chompers, resetting the balance so that Fido won’t clear the room with his goofy grins. 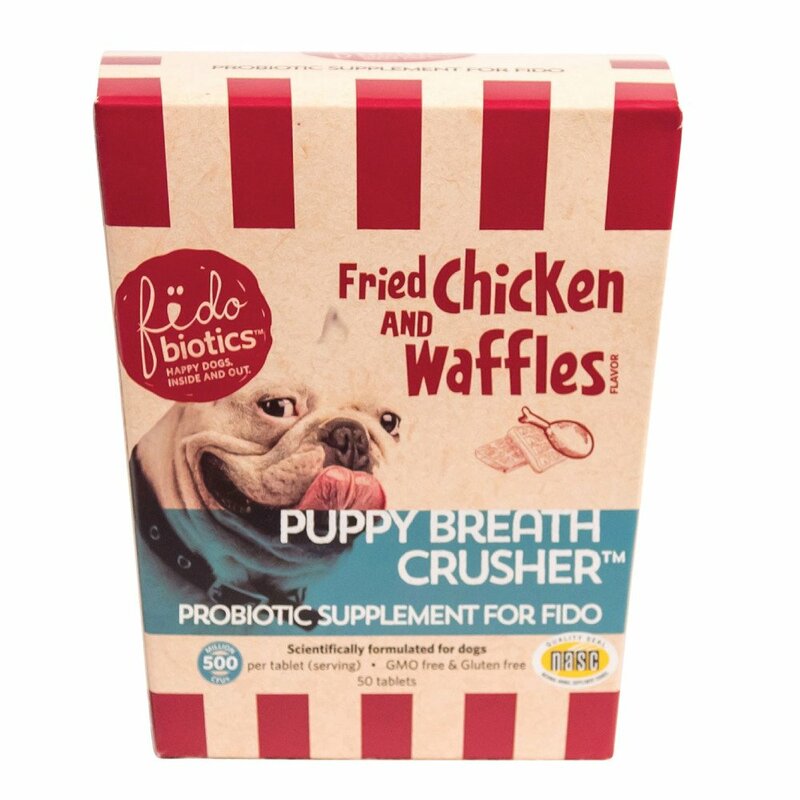 Acting as a breath deodorizer, Puppy Breath Crusher has 500 million CFUs per tablet and contains barley grass, kale, alfalfa and citrus bioflavonoids, which are all excellent breath-freshening agents, and helps promote healthy gums. Our mouthwatering Chicken and Waffles flavor is so good, you’ll no longer have to fear those sloppy smooches. Puppy Breath Crusher is chewable and can be given one or more times daily to help bust puppy breath and promote healthy digestion. One box has 50 flavored chewable tablets. Ingredients List: Rice maltodextrin, Cellulose, Chicken flavor, Gum base, Beef liver, Barley grass, Dried Bacilllus subtilis fermentation product, Dried B. licheniformis fermentation product, Stearic acid, Magnesium stearate, Citrus meal (bioflavonoids), Maple flavor, Kale, Alfalfa, Silca.